The discovery of oil in 1966 converted Dubai from a small fishing settlement to one of the busiest trade centers. One among the seven Emirates of the United Arab Emirates, Dubai is the most populated and the second largest. Dubai is famous for its unique real estate projects, sports events and exquisite sports facilities, Dubai shopping festival and for accommodating a large immigrant work force. The city center is divided by Dubai Creek with Deira on the northern side and Bur Dubai on the south. The official language of Dubai is Arabic but with a mixed populace you get to hear a lot of English, Malayalam, Persian, Hindi, Urdu, Tamil and German. Dubai is the only Emirate that has a Hindu temple and a Sikh Gurudwara. Emerging as a major business hub, Dubai UAE has many hotels, is well connected by flights and offers job opportunities. Its unique beaches and manmade islands are a great tourist attraction. Dubai lies in the arid tropical zone and has soaring temperature and high levels of humidity in summer and temperate winter and irregular rainfall (barely 5 to 10 inches annually). Summers can have temperatures rising up to 47 degree centigrade. Accommodation in this dream city is not a problem. Being a trade center; Dubai has some of the finest chains of hotel. Be it a business trip or vacation trip, you can find a hotel of your choice here. Luxurious hotel accommodations in Dubai are pretty expensive and can range from US $150 for a single occupancy room to US $ 600 for a suite. Dubai offers seven star, five star, four star, three star, luxury hotels, beach hotels, beach resorts, cheap hotels and hotel apartments. There are budget accommodations too. All international airlines have their presence in Dubai and cater to countries all over the world. Dubai is very well connected to all major cities of the world; most major airlines have operations to and from Dubai. The present-day airport in Dubai opened as an airfield and has grown to be one of the biggest aviation hubs in the Middle East. It is one of the fastest growing airports of the world and is rated among the top ten airports of the world. Visa is compulsory for all tourists to Dubai. Citizens of few countries have to apply for the visa prior to visit and get it stamped on arrival. The Dubai duty free area is spread over 5400 square meters is one among the top three airport retailers of the world and has attained this stature right from its inception in the year 1988. Over 35,000 product lines are presented and a broad class of merchandise is available for the travelers. A skyscraper under construction in Dubai, Burj Dubai will be the tallest building of the world and the tallest man made structure in the world. 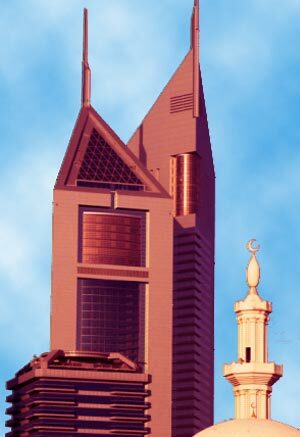 In Arabic “Burj” means tower and Burj Dubai will connote Tower of Dubai and is located at the end of the old town Burj Dubai. The exact height of the building is yet not released officially and is assumed to be 808 meters, subject to changes. The building is based on the six-petal desert flower design. The building is expected to open by the 30th of December, 2008 and is expected to have the fastest elevators in the world. The building is being erected on a manmade lake. Palm Islands, Dubai are a combination of three artificial islands - The Palm Jumeirah, The Palm Jebel Ali and The Palm Deira. They are aptly named as the Palm islands as they are shaped to resemble palms with a crescent on top. The Palm islands are also referred to as the Eighth Wonder of the World. These islands are located on a stretch of 520 km off the Coast of the United Arab Emirates in the Persian Gulf. Palm Jumeirah is slotted for completion in the year 2007, Palm Jebel Ali in 2007 and Palm Deira, which is the largest of the three and is expected to be as big as Paris in another 4 years. Palm Deira is being built in water that is 6 meters deep and is estimated to reach 22 meters below mean sea level. Residential complexes, villas, star hotels, resorts, retail outlets, restaurants and many more amenities will be featured on these islands. Dubai is rightly named 'shoppers paradise', as Dubai is an open port with low import duties. Tax-free policy of Dubai offers shoppers genuine top brand names at relatively cheaper prices when compared to any other country of the world. The annual Dubai Shopping Festival attracts millions of tourists from all over the world and any shopper would readily shop till he drops. From exotic perfumes of France to electronic goods from Japan, gold ornaments to designer clothes – you can pick them all! In Arabic Dubai shopping Festival is termed as 'Layali Dubai'. This annual extravaganza commenced in 1996 and since then come February Dubai becomes the shopping destination of the world. The theme of the festival is one world, one family, one festival and has become a world wide acknowledged affair. With more than 2,300 retail outlets participating in the event, Dubai shopping Festival has everything to offer under a single roof. The hotels of Dubai offer the best discounts on their tariffs and Emirates airlines offers additional baggage allowance and tickets at discounted rates. Fashion shows, events for children, fireworks during nights, film festivals, cultural events and the most popular Dubai World Cup is held during the shopping festival. Travel within the city is not a problem, with many a car rental office offering a choice of vehicles, with or without a driver. The fares are fixed and it is advisable to book your taxi from a reputed firm. If you wish to drive by yourself then you will need a valid international or national driving license. Do not miss out on the boat ride in the Creek while at Dubai. Dubai has an odd distinction - it has a majority of expatriate population mostly from Asia and neighboring countries and thus is a major job opportunity hub. Jobs are available at diverse levels of employment, from semi skilled construction labors, artisans, junior staff to management staff. Employment is handled through recruitment agents/consultants and a fee has to be paid for the application form. The employer after hiring an employee signs a contract with the employee for a fixed period called the sponsorship. Salaries are spoken of to be attractive in Dubai, as they are highly dependent on workforce from outside their country. The Government of Dubai (UAE) has a policy against naturalization by the expatriates while allowing them to own properties subject to certain stipulations. First Published Date: Dec 28 2006 Last modified Date: April 25 2019 This page may have been updated recently as new information is available or the content may have been edited for better readability.